For the cleanup day, we are asking that you arrive to the event before 8:45 AM. 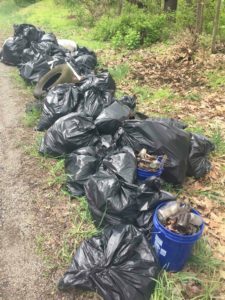 We want to make sure there is adequate time to assign everyone to their cleanup location. Volunteers can park their cars at St Paul Evangelical Lutheran Church parking lot located at 108 Dutch Hill Road, Latrobe, PA 15650, and we will shuttle you to your designated location. We will also have our tent set up at this lot with some refreshments and snacks! We will be providing the vests, gloves, and trash bags for the volunteers. Make sure you wear the proper attire, for April has very unpredictable weather. Dress in layers and we suggest that you wear long sleeves and pants! It is also recommended to wear either hiking boots or older tennis shoes. We can’t wait to see you there! If you have any questions about this event, please call our office at 724.423.3000. NEXT POST Next post: The New MY.CITIZENSFIBER Page!